Plumb bobs helped build the pyramids. 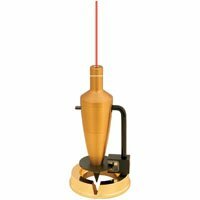 Swanson s precision accurate, premium brass plumb bobs are constructed of solid spun brass for heft and durability. 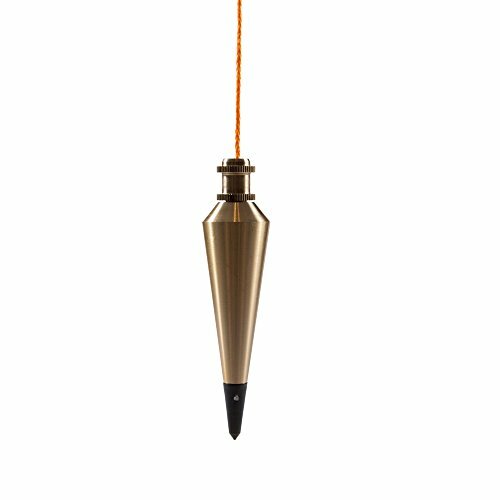 The Swanson 8-Ounce Plumb Bob is constructed of solid brass with a hardened steel tip, and comes with a 1-year limited manufacturer's warranty. Warranty: Swanson Tool Co., Inc. warrants its products to be free from defects in material and workmanship for 1 year from the date of the original purchase. Swanson's only liability under this limited warranty shall be at their option to repair or replace any product determined by Swanson to be defective. No damages or other remedies available. 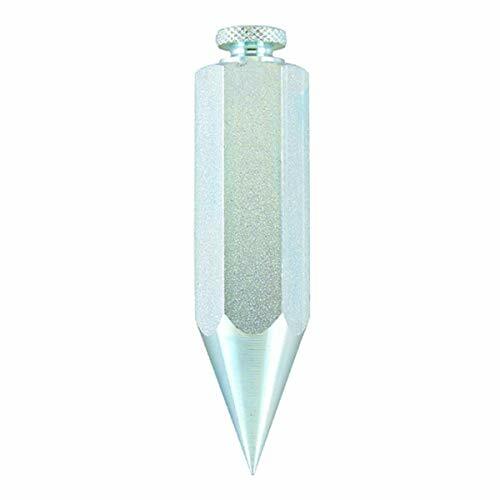 General Tools professional quality Plumb Bobs have been a staple of the masonry, carpentry and surveying industries for more than 50 years. General Tools steel plumb bobs feature a hexagonal body of cold-drawn steel with nickel plating. Features a removable cord cap for easy cord replacement; Cap is used used with 3/32 inch cords. This plumb bob weighs 8 oz and is 4 inches long and 7/8 inches wide. Includes a 10 foot long 3mm braided cord and a removable cap for adjusting and replacing the cord. GENERAL TOOLS - THE PRECISE TOOL FOR DOING THE JOB EXACTLY RIGHT. Offering over 1,000 tools, we re proud to provide tradesmen, craftsmen and DIYers around the world with a broad range of affordable, specific-purpose mechanical hand tools and precision measuring and inspection tools. 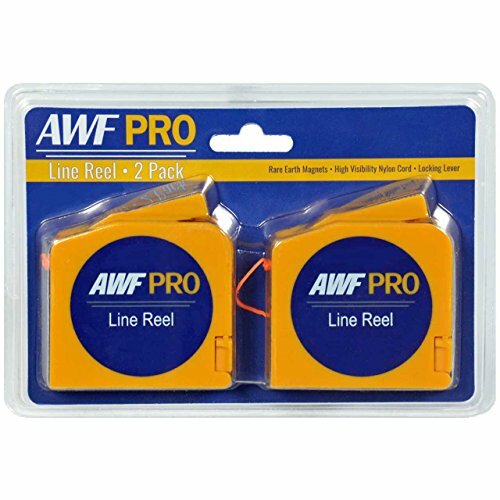 Pack of 2 Retractable Line Reels for Plumb Bobs. Line Reel features high visibility nylon cord, locking lever and rare earth magnets for attachment to steel studs, fittings and furniture. Plumb Bobs are one of the simplest tools to establish a perfect vertical line or plumb line. Our set comes with 2 precision made All Brass Plumb Bobs (16 oz and 8 oz). Each plumb bob comes with 2 replaceable steel tips (one is hidden in cap), for a total of 4 steel tips. Both sizes use the same interchangeable caps and tips, making switching sizes quick and easy. Our Retractable Line Reel comes with approximately 14 feet of bright orange braided nylon cord, rare earth magnets to attach the reel to steel or iron and a fold out bracket to hang the reel on a nail, screw or tack. To attach the cord to the plumb bob, just remove the screw in cap; thread the cord through the center opening; knot it and reattach cap to plumb bob. The nylon cord pulls easily out of the reel. Press the locking lever once to hold the cord in place. Press the locking lever again to release the cord. When done the line will self retract into the reel. As a bonus, our kit includes a Specialty Pencil Sharpener designed for cutting carpenters pencils and 2 pencils to get you started. All this packaged in an attractive, durable, zippered protective case. 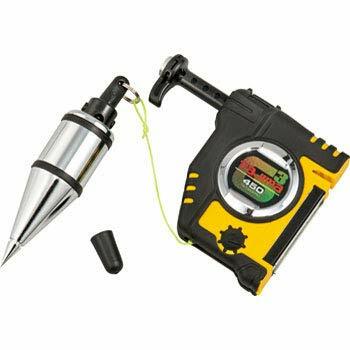 Elastomer-wrapped universal plumb bob setter with commercial-grade 14 oz. bob. New steel reinforced setting pin to be used with a hammer when tacking into wood and drywall at heights above-head. Strong magnet for attaching to steel frames and ribbed eyelet to hook onto nails or studs. Braided nylon line extends and holds at lengths up to 14-1/2 ft., retracts into case automatically. Internal "flush pin" for zero distance measurements with plumb line flush with surface. 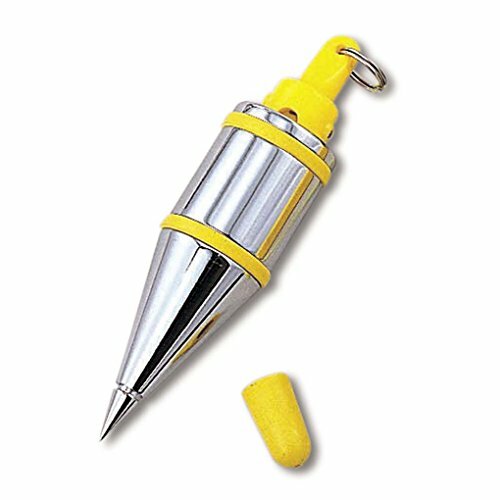 Unique plumb bob features a quick-stabilizing cap that reduces bob wobble and spin. Bob also featured embedded elastomer side bumpers and a thick tip guard. Adjustable for bobs weighing from 3.5 oz to 35 oz. 47-973 Features: -Screw top to easily attach string to center of plumb.-Long slender profile for easy storage.-Replaceable, hardened, steel tip for longer life.-Through hole for easy tightening.-Brass.-8 oz.-Carded. Includes: -Additional tip included. Construction: -For use in framing, deck building, plumbing, transit location, and construction applications.-Polished lacquered solid brass construction resists rust. 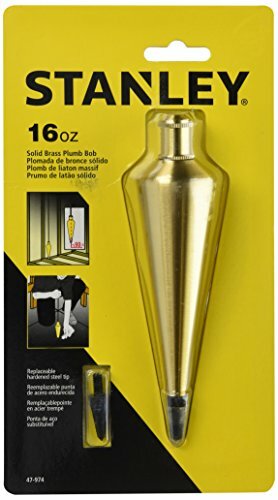 Amazon.com This Stanley Brass Plumb Bob comes in an 8-ounce design and is ideal for use in framing, deck building, plumbing, transit location and construction applications. The screw top simplifies attachment of the string to the center of the plumb. The polished-lacquer solid brass construction is durable and rust resistant; the plumb bob's long and slender profile allows for easy storage. The replaceable, hardened steel tip provides longer life and an extra tip is included. The thru-hole ensures easy tightening. This plumb bob is backed by a lifetime limited warranty. 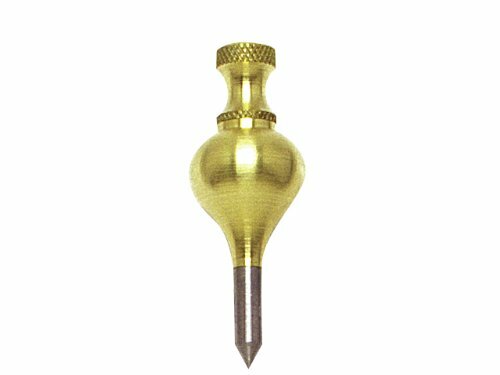 This Stanley Brass Plumb Bob comes in an 8-ounce design and is ideal for use in framing, deck building, plumbing, transit location and construction applications. The screw top simplifies attachment of the string to the center of the plumb. The polished-lacquer solid brass construction is durable and rust resistant; the plumb bob's long and slender profile allows for easy storage. The replaceable, hardened steel tip provides longer life and an extra tip is included. The thru-hole ensures easy tightening. This plumb bob is backed by a lifetime limited warranty. 2721-2257 Features: -Screw top to easily attach string to center of plumb.-Longer slender profile for easy storage.-Replaceable, hardened, steel tip for longer life.-Thru hole for easy tightening.-1 lb.-Carded. Includes: -Additional tip included. Construction: -For use in framing, deck building, plumbing, transit location and construction applications.-Polished lacquered solid brass construction resists rust. General Tools professional quality Plumb Bobs have been a staple of the masonry, carpentry and surveying industries for more than 50 years. General Tools steel plumb bobs feature a hexagonal body of cold-drawn steel with nickel plating. Features a removable cord cap for easy cord replacement; Cap is used used with 3/32 inch cords. This plumb bob weighs 5 oz and is 3-3/8 inches long and 3/4 inches wide. Includes a 10 foot long 3mm braided cord and a removable cap for adjusting and replacing the cord. GENERAL TOOLS - THE PRECISE TOOL FOR DOING THE JOB EXACTLY RIGHT. 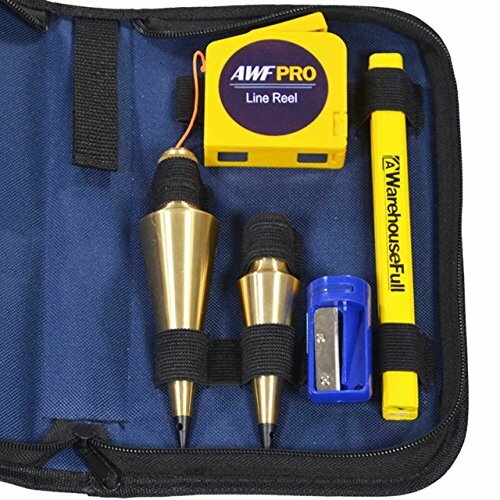 Offering over 1,000 tools, we re proud to provide tradesmen, craftsmen and DIYers around the world with a broad range of affordable, specific-purpose mechanical hand tools and precision measuring and inspection tools. 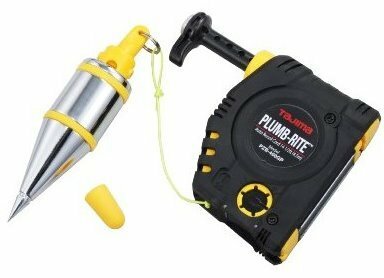 The Tajima PQB400 is an easy to use plumb alignment and centering tool that works on a simple and consistently reliable principle; gravity. Universal setters that quickly set to wood, drywall and steel surfaces, and quick-stabilizing plumb bobs that reduce time-robbing bob wobble and spin. Plumb bob setter with quick stabilizing 14 oz. bob. Made of accurately machined steel. External nickel plating is corrosion-resistant. Made of steel, with precisely turned points and self-centering, cavity type cap for holding cord. Chrome-plated for rust resistance. Carded. Warranty: 1 Year Warranty: Johnson Level warrants this product against defects in material and workmanship for one year after the confirmed purchase date. At its option, the company will replace or repair the product if it fails under normal use. CST/Berger 11-497 6 oz. Brass Plumb Bobs. Precision machined for perfect balance. Comes with a hardened steel point and ASA THD. Steel ASA screw cap allows storage for extra point. Brass body is lacquered for lasting finish.